The concept of the living trust is a simple one; this term describes a trust into which the settlor (that is, the individual who establishes the trust) can transfer assets while they are still alive. There are a number of reasons for doing this, and these individual circumstances will determine the type of trust that is used. 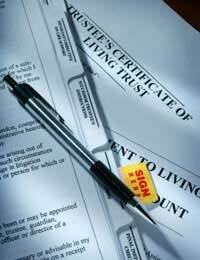 Generally, however, when the term ‘living trust’ is used, it is generally intended to mean a ‘revocable’ living trust. Revocable living trusts, as the name would suggest, are living trusts over which the settlor has control at all times. Thus, they have the freedom to change or make amendments to the terms of the trust, or they can revoke it entirely at any time. In most cases, this is aided by the fact that the settlor will also be named as trustee and beneficiary. As such, they will not only continue to receive the benefit from the assets that they have transferred, they will also have complete control over the management of those assets as a trustee. Clearly, therefore, an irrevocable trust is one in which the settlor gives up those rights of revocation and amendment. Assets that are placed in an irrevocable trust are given up by the settlor in both title and in practical terms; they cease to have any control over the management of those assets and, in most cases, they cease to derive any benefit from them. This is in contrast to a revocable trust, under the terms of which the settlor may well give up their assets only in title. The terms of an irrevocable trust would appear to make this a highly unattractive choice. However, these arrangements can serve a valuable purpose in some circumstances. As has been mentioned, a settlor can continue to derive benefit from assets that are transferred into a revocable trust. In this way, although they have given up the legal title to those assets, they are still capable of earning from them. As a result, any income derived from assets placed in a revocable living trust will be subject to income tax. Furthermore, it is likely to be counted as part of the settlor’s estate for the purposes of inheritance tax. Under the terms of an irrevocable living trust, however, it is possible to ensure that the assets transferred into trust will not be subject to income or inheritance tax. In order to achieve this, however, it must be shown that the settlor is deriving no benefit from those assets. The first step towards this is the appointment of an independent trustee; the settlor may not appoint him or herself as trustee. Furthermore, the settlor must not have any opportunity to earn income from the trust, or use the assets placed in trust for any purpose. There are, however, a number of significant drawbacks to this tax liability mitigation plan. In the first instance, this is clearly a route available only to those who are sufficiently financially secure to essentially write off a portion of their assets. Perhaps more importantly, it must be remembered that the trust itself will be required to pay income tax on the assets held within it, even if the settlor does not. The benefit comes as a result of the lower tax rates available on assets held in trust. Further information about tax planning and living trusts is available in an article elsewhere in this section. Living Trusts vs Lasting Power of Attorney: Which is Right for Me? What If I Want to End My Living Trust? I would like to create a trust structure to protect my personal assets against any conceivable future business failure. Can you refer me to someone who could help me with this?